Just based on your height and weight, everything you've said about all those jerseys being too big for you makes sense. A CCM large replica is going to fit considerably smaller than all of them. Yes, Edge 2.0's fit smaller than the other jersey brands with the same number size. If you were going to buy a retail 2.0 just to wear, I would think a 54 would be more than big enough for you, and you might even be comfortable in a 52. But the funny thing about Edges is that you can go up a couple of sizes and it really doesn't look 2 sizes bigger. So if you buy a 56 gamer, it will probably fit rather large, but it should look considerably less oversized than that 6100 56 or the Nike 52's. 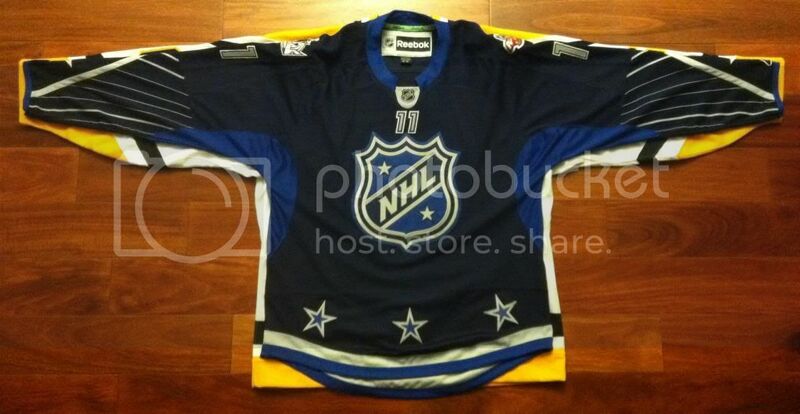 Yeah Edge 2.0s are by far the best fitting jersey to not look goofy in. I can wear anything from a 54 to 60 (58+ in gamers) and it looks fine. 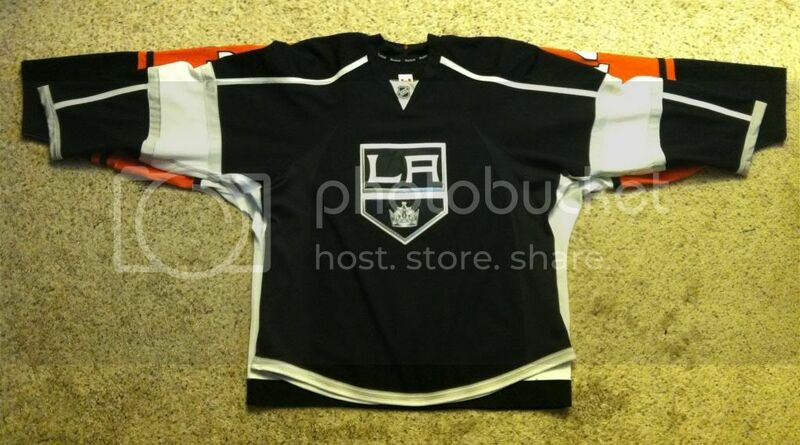 Obviously youll want to stay on the smaller size but its not so bad with these jerseys. This is a size 56 2.0 on top of a size 54 CCM 6100, both gamers. The width of the 56 is 26" at its narrowest, and tapers up to about 27 1/2" at pit gusset level. I have one of those same pics too. Heres a pic I posted a while back. Its an Edge 2.0 size 58 on top of a 6100 size 52. Very true- I've been analyzing (lol) this for a while and here is my conclusion: the EDGE cut/template, in which the bottom comes down in a "curve" allows for it to be higher on your sides. So if an EDGE is a tad too long, it doesn't look as bad b/c your eye will see more of your pants by your pockets etc. and this change in length offers a visual contrast. Additionally, since it is by nature a more tapered shirt, it helps if in fact the jersey is a tad too large. (I've tried on a EDGE 52 and while my ideal size is a 46, I could pull it off w/o looking completely ridiculous). Now your CCM/Starters, which are basically wide squares/rectangles, offer little forgiveness. If the jersey is too big and long, game over. I have an EDGE 1.0 that's a size 46 and is 32 inches long and a Starter mesh size 46 that is the same length. The Starter hangs under my arse cheeks, covering my back pockets but the EDGE, because of it's curvy bottom, gets shorter on the sides and looks ok.
Now I've never had a ProPlayer or 6100, but from all pics I've seen, they seem HUGE. 6100s are just the pre-Edge Reeboks, right? Now, I'm a large motherfrigging dude. 6'2", 320. My Syracuse Crunch gamer is a pre-Edge Reebok, size 56. Fits me about the same as a normal XXL t-shirt. Not too loose, but not tight. I also have an old Reebok Albany practice jersey in a 56 that fits exactly the same. For reference, I wear a 56 in a suit, XXL in a t-shirt. The pre-Edge Reebok 6100's are also the same as the CCM/Kohos from the 2000's. I cant seem to find an accurate size comparison between jersey versions. I currently have a mid 90's CCM Rangers blank and I wanted to pick up an Edge 2.0 or 6100 blank and have them both lettered up. If a 52 in the CCM fits me good the what would the edge 2.0 and 6100 equivalants be? General rule is add 4 to the size. thank you for the info and quick reply... I assume that goes both the edge 2.0 and 6100? I'm bringing this old thread back as I need some help. Getting into the old CCM's and I'm wondering how a 48 would compare to an Edge 2.0 46. A CCM 48 is considerably larger than an Edge 46 2.0. I'd say the 48 compares most closely to a 52 in the 2.0. I have a question...the sizes 52, 54, 56 used to refer to the chest size, in inches. That's why as reported above, there used to not be a big difference between a 52 and 54, there's just an extra inch on each side. 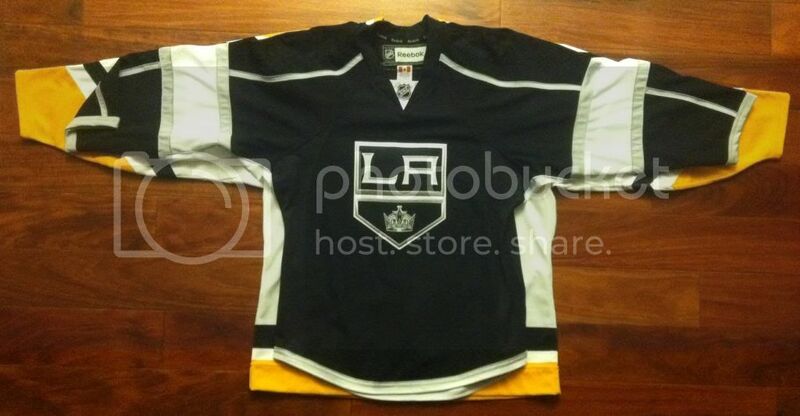 Do the EDGE jerseys go this way? Is the chest size accurate? I know they are more tapered overall, but does a 54 still have a 54" chest? I have never measured, all I know is what fit me in a 6100 does not in an EDGE. EDGE jerseys do not fit to size that way. The general rule is to add +4 to EDGE's ( if your a 52 In a 6100 then you would be 56). The sleeves will be longer on 1.0's (wizard sleeves) than the 2.0's. I know the size difference, the question I had was whether the chest measured to what the size was, i.e. a 54 Edge should have a 54 inch chest, even if the rest is tapered and it won't fit the same as a 6100. A 54 EDGE does not have a 54 inch chest. There smaller hense why the +4 size correlation. Having received my first 2.0 today, I'd add that in my opinion the body of the 1.0 and 2.0 is about the same. The 1.0 sleeves are longer, but the 2.0 are wider, like the old CCM or 6100. If by "vintage CCM" you are merely referring to a 1990's ultrafil or air-knit, I wouldn't be too worried about it being too small- it's actually slightly larger than a Premier medium. If you are referring to the 2003 CCM 6100 Vintage series air-knits, those fit even larger (slightly) than the 90's CCM's. Here is a pic I took a long time ago. Its a Reebok Edge 2.0 size 58 on top of a Preds Reebok 6100 size 52. Reebok 6100's ran a bit bigger than the CCM and later KOHO 6100's. Just for comparison, I have a 99-00 CCM size 56 that is a dead on 28" across the chest but, my 05-06 Reebok 56 is 29 1/2" across the chest. So my theory of adding 4 for comparison of Edge to 6100 applies to only the older CCM/KOHO 6100's not the Reebok counterparts. Rob, not trying to disagree with you here, but to me it seems like the 99/00 CCM's were shaped and sized comparably to the ultrafils and air-knits that were used earlier in the 90's. After the turn of the century, when the CCM logo moved up to the collar area, the jersey cut changed somewhat and the arms became significantly wider and baggier, and even the width seems a bit greater on the 2000 and later models. So yes, I would agree that a Reebok 6100 would generally be larger than a 90's CCM of the same numeric size, but is it really larger than a CCM or Koho of the 2000's? I have a decent number of 6100's of all 3 brands and haven't really noticed that one brand was consistently larger than any other. Curious to hear if any others think their Reebok 6100's are larger than the CCM/Kohos. So I'm average height. The Edge 1.0's I currently own are 50, which fit fine. I'm able to squeeze into an early 90's CCM 44. Sleeves are too short, but I roll them up anyways. The jersey is tight on my masculine shoulders. It's long enough overall, but if I lift my arms too high, I probably risk showing off my Arse crack (not sure, not wearing it right now). But it fits fine enough that I'd tolerate it for rare jerseys, or great deals on ultrafils, just not as desirable as possible. With this detailed information......could I possibly consider Edge 1.0 size 46? I've seen some size charts, but with 2.0, Indo, and 1.0 often confused together, I'm unsure of which one to trust. Is a 46 significantly smaller than a 50? It may possibly depend on which model (team) size 46 you're looking at. Like you, I'm good in size 50 1.0's. But CCM 44's aren't too tight on me. (Not worried about the Arse crack thing) I've always avoided size 46 1.0's because I tried a Kings one a long time ago, and it was too narrow, less than 21", if I remember correctly. But I recently took a chance on a size 46 2009 ASG 1.0, and it actually fits OK, not that much smaller than the size 50 2009 ASG I picked up at the same time. Sleeves on the 46 are longer than the ones on a CCM 44. But if you have to squeeze into the CCM 44, I would say you'd be taking a big chance on the size 46 1.0.